Because we are a volunteer-driven organization, there are many ways to help. 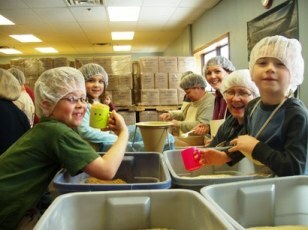 One way is to simply make a tax-deductible monetary contribution, and the other is to volunteer your time or resources. Some of our needs are great, some are much smaller or easier to fulfil, but every single one of them is needed for us to continue our fight against world hunger. KAH Liaison: In this position, you will leverage your connections with schools, businesses, civic groups, etc. 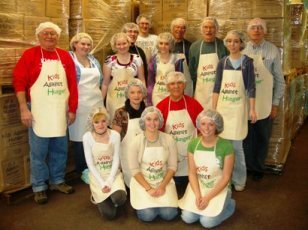 As a KAH Liaison you will serve as the contact person for your "group" to educate them on the mission of KAH and how easy it is to make a difference; coordinate a fundraiser (think about a penny drive or holiday collection) if appropriate, and schedule your group in a couple times/year to package. Or plan one large event that funds itself. This should take just a few hours of your time a month. Do you have a neighbour, friend, family member that attends a different church or works for a large company that you think would also like to be a Liaison? Packaging Supervisor: In this position, you will help manage packaging events. When a group comes in to package, the packaging supervisors educates the group on KAH - possibly show the video (depending on the age of the group), demonstrates the steps and oversees the packaging session and the clean up (groups clean up after themselves). Fund Raising: In this position, you will work with a team to help define and plan fundraising events. If you have experience or a passion for helping us to raise funds and community awareness for KAH we need you. You will also help to oversee the events. Public Relations: Do you work for a radio or television station or have a local contact that you can get excited about KAH? We'll need the coverage to get the community involved. Our revolutionary food package provides 6 nutritionally-complete servings for only 20 cents per serving. by maintaining worldwide partnerships with humanitarian organizations. Copyright © 2018 Kids Against Hunger Bay Area/Pleasanton. All Rights Reserved.